UTest allows companies to outsource their QA testing to ‘the cloud.’ The company provides on-demand testing services through its community of 30,000+ professional testers from more than 160 countries around the world. Customers specify their testing requirements and uTest handpicks the testing team that matches their needs best, based upon locations, languages, OS, browsers, mobile devices and/or carriers. Testersa are paid depending on the number and type of bugs they find, and the marketprice for bug finds fluctuates depending on the number of bugs left to find, the demand for testers, and other criteria. 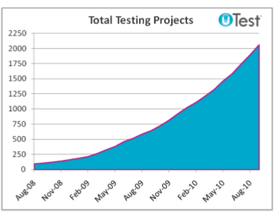 The new funding will be used towards expanding uTest’s tester-base, moving into service categories, and expanding the company’s recently launched usability testing and load testing services.